Angola has few domestic legal provisions governing use of force by law enforcement officials and those that do exist are more permissive than international law allows. The state shall respect and protect human life, which is inviolable. The state shall respect and protect the human person and human dignity.Art. 31(2), 2010 Constitution. 1. Everyone shall have the right to physical freedom and individual security. 2. No-one may be deprived of their freedom, except in cases prescribed by the Constitution and the law. The state and public corporate bodies are civily liable for human rights violations committed by their organs and agents in their duties, and individuals are subject to criminal and disciplinary sanctions for any violations for which they are responsible.Art. 75, 2010 Constitution. The role of the National Police Force is also described in the Constitution. 1. The National Police Force shall be the national, permanent, regular and non-partisan police institution, organised on a hierarchical basis and in terms of the discipline required for the protection and safety of the country by the police force, with strict respect for the Constitution, the laws and any international conventions to which Angola may be a party. 3. The law shall regulate the organisation and functioning of the National Police Force.Art. 210, 2010 Constitution. The Republic of Angola shall act using all appropriate legitimate means to preserve national security and shall reserve the right to resort to legitimate force to restore peace and public order, in compliance with the Constitution, the law and international law.Art. 203 (Right to national security and legitimate defence), 2010 Constitution. Angola’s National Police is a militarised force that is obligated to respect fundamental rights and freedoms in tackling criminality. Harm caused by police abuse of their powers is to be criminally repressed. Applicable national legislation also institutes the principle of command responsibility, notably in the case of torture or other forms of inhuman treatment.Art. 357, Criminal Code. 1. National security activity shall be guided by the observance of the general police rules and respect for the rights, freedoms and guarantees and other principles of the democratic rule of law. 2. Police and security measures shall be those provided for by law and shall not be used beyond what is strictly necessary. Not to make use of arms, except in the case of an imperative need to repel an attack or its imminent attempt, against themselves or against their post of service; or when the maintenance of the order so requires; or whenever their superiors so determine; and also to secure, where indispensable, any detained persons.Art. 5(38), National Police Discipline Regulations, issued by Council of Ministers Decree No. 41/96, 27 December 1996. 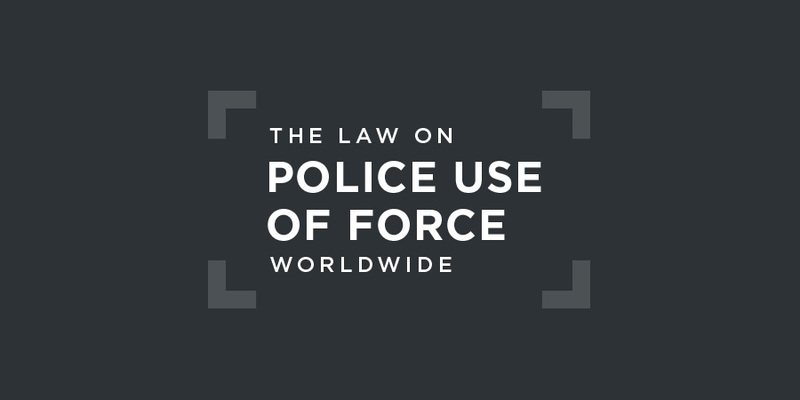 This provision does not comply with international standards governing police use of force. Excessive or abusive force against detainees is prohibited by the 1996 National Police Discipline Regulations.Art. 5(48), National Police Discipline Regulations, issued by Council of Ministers Decree No. 41/96, 27 December 1996.However, this provision also includes an explicit exception where force is used in cases where the detainee offers resistance, tries to escape, or succeeds in escaping and is in flight. The Angolan National Police is an autonomous institution under the Ministry of Interior, and its General Command is responsible for the oversight of their activities and application of disciplinary measures.Arts. 6 and 9, 1993 Ministerial Decree on the Angolan National Police.Angola has no independent body in charge of supervising police activity. In 2013, the Human Rights Committee regretted in its concluding observations on Angola that no independent complaints authority exists to deal with complaints about excessive use of police force, which are currently only dealt with by a police force investigator. Nonetheless, the independent Justice Provider (Ombudsman) also conducts oversight of human rights compliance and has issued reports on public complaints on police abuse in 2011 and 2012, especially regarding unlawful arrests.See variously: Art. 192, National Constitution; Arts. 1, 4, and 18, Statute of the Justice Provider, 28 April 2006; Justice Provider’s Office, "Report on the First Semester of 2012"; and Justice Provider’s Office, "Report on the year of 2011". at reports of torture and ill-treatment or excessive use of force by the police or security forces during arrests, in police stations, during interrogation as well as in other detention facilities.Human Rights Committee, Concluding Observations on Angola's initial report, UN doc. CCPR/C/AGO/CO/1, 29 April 2013, §15. ensure that investigations of alleged misconduct by police officers and security forces are carried out by an independent authority. It should further ensure that law enforcement personnel receive training on prevention and investigation of torture and ill-treatment by integrating the Manual on the Effective Investigation and Documentation of Torture and Other Cruel, Inhuman or Degrading Treatment or Punishment (Istanbul Protocol) in all their training programmes. Allegations of torture and ill-treatment should be effectively investigated and alleged perpetrators prosecuted and, if convicted, punished with sanctions commensurate with the seriousness of the crime; victims should be adequately compensated.Human Rights Committee, Concluding Observations on Angola's initial report, UN doc. CCPR/C/AGO/CO/1, 29 April 2013, §15. Angola has not ratified the Protocol to the African Charter on Human and Peoples' Rights, allowing the African Court to hear cases alleging a violation of the Charter by the state. Criminal prosecutions of police officers for unlawful use of force are believed to be rare. In 2017, Angola's Constitutional Court dismissed the charges against the former Police Delegate of Luanda, Antônio Manuel Gamboa Vieira Lopes, who was accused of having ordered the abduction and killing of Alves Kamulingue and Isaías Cassule. Other officers of the National Police were, however, held responsible for serious criminal offences.Constitutional Court, Chamber Judgment No. 464/2017 (Procedure No. 530-C/2016).